We're deep in the heart of hay feeding season! 3/4/10: Hey! Your Forgot Our Treats! 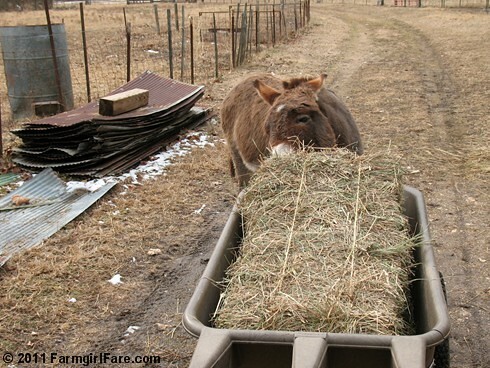 © FarmgirlFare.com, the slightly rotund foodie farm blog where I once read that the most common bad thing people do to their donkeys is let them get fat—and that it's so easy to do because they love being fed and are always so happy to get treats. I can definitely relate! 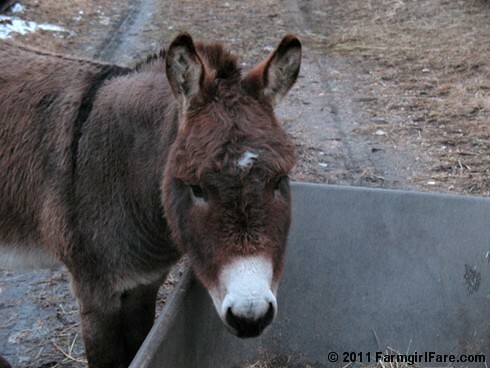 I look forward to the daily donkey-your buddies are too cute for me !~! That little Gnat is the CUTEST little thing I ever saw! Just love the new look of your blog, so easy to see everything! Looking forward to the donkey pics. It's nice to see Dan again. He must have been feeling pushed out by the babies! On this really snowy and still storming morning, this is most welcome news. I am a DDD and donkey fan from way back. What fun to look forward to the Daily Donkey. You made my day, as you have done so often. I saw the 'Coming Soon' announcement in the corner and thought 'Heehaw' myself - a daily dose of sweet donkey-ness is a treat for all! Can't wait to see what's up with the donkeys! Of course, you could have 'daily doggies', daily sheep, daily chickens, daily cats - love them all!! Your new 'look' is awesome - your hard work is wonderful! Donkeys aren't the only "pets" who struggle with chubbiness during these cold winter days! My Moxie Kitty wants nothing to do with the snow outside & thinks anytime someone walks into the garage, she is supposed to be fed! Before I found your blog, I thought I was the only one that was in love with donkeys and their adorable personalities and antics. My daughter's in-laws own a small ranch with donkeys and I can't wait to visit my little furry friends when I am in Northern California-these little guys bring me so much joy! I am looking forward to "The Daily Donkey!" 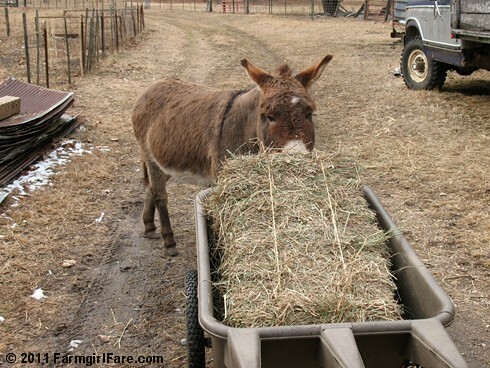 I luv to hear my neighbors donkeys braying. I have just stumbled across your fantastic site and as I too am a longear lover I was particularly interested in your donkey blogs. The photos are so cute. I am a volunteer for the large English Donkey Sanctuary in England and help out my local branch, where we do riding for disabled and disadvantaged children. I have lots of photos on my website of the donkeys and fundraising events so if you would like to read more then please click on my name.